Ask fellow campers about "McArthur's Temple View RV Resort" and nearby attractions. Access to the park is good. It is far enough away from I 15 that one does not hear much traffic. It is an urban park so some city noise is present. Check in was quick easy and informative. Our site, 50, was a gravelled back in. It came with a concrete patio and table. The table was awkwardly placed at the rear so we didn't use it. It also came with the usual power, water and sewer well placed to the left rear. Cable was available but one needed a box. We were only over-nighting so didn't bother. OTA channels worked great. This park caters to Snowbirds thus there were planned activities as well as other amenities one would expect to entertain longer staying users. We did not partake. There is a well grassed and clean pet area near the office. This park is very clean and well card for. Restaurants are located withing a reasonable walking distance. Shopping and other services are nearby. We paid $42.26 with a GS discount and feel we received good value for our dollar. We would return. 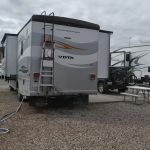 We camped at McArthur's Temple View RV Resort in a Motorhome. Nice RV park but the Internet is the worse I have seen. 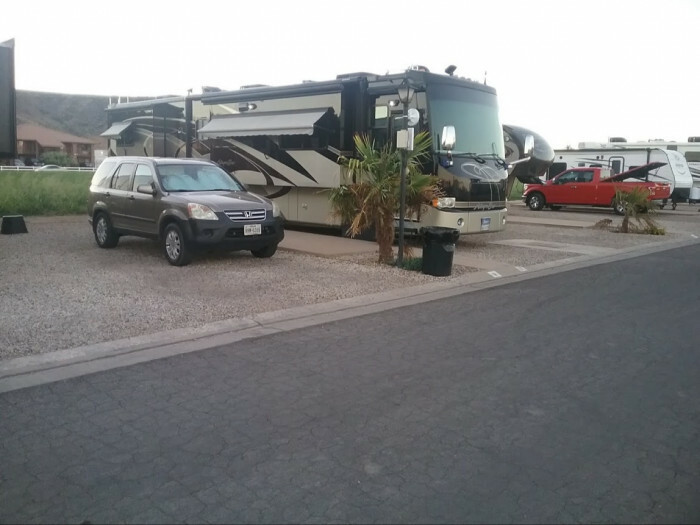 We camped at McArthur's Temple View RV Resort in a Motorhome. This is a good sized campground, but mostly filled with snowbirds park model units. There are sites available for short term stays, mostly back-ins and a limited number of pull-thru spots. several back-in sites are scattered among the park models, but the spacing is tight and the entrance angle is awkward, especially for rigs over 32-ft or so. Our pull-thru overnight site was the end spot on a row of what may have been at one time, an overflow parking lot. Not fancy by any means, but adequate for overnighting. All in all, maneuvering through the park needs to be done very carefully, especially so with bigger rigs. But the good news is that one of the friendly staffers was there to guide us into our spot and to make sure we understood which hook-ups were the ones we should use. There's no trees in the park so shade during hot weather is only something you can dream of. And while you're dreaming, dream up a picnic table to replace the aluminum tables at each site. Probably OK to use during cool weather, but not hot weather. Having said all that, the park is conveniently located just off I-15, but far enough away you don't hear the traffic noise. The staff is friendly, knowledgeable and extremely helpful. We'd stay here again, but only if we were sure of getting a pull-thru site. 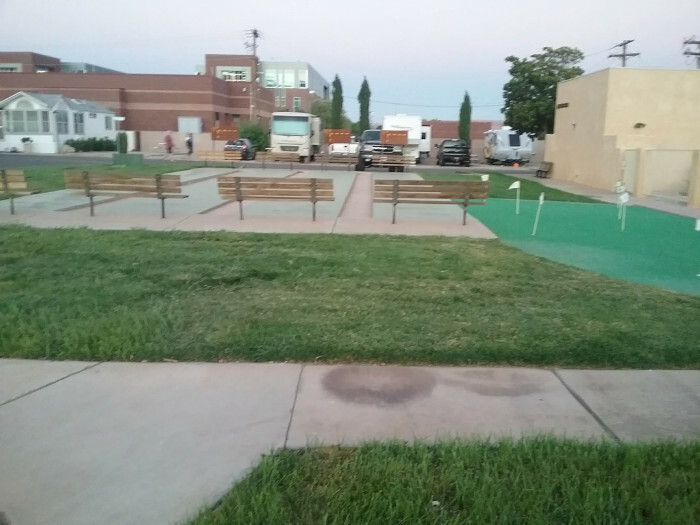 We camped at McArthur's Temple View RV Resort in a Fifth Wheel. On a previous trip, we used the park as a jumping off place to visit Zion National park. We were there is early spring, so the hordes of people crowding the park hadn't materialized at that point. The park is stunningly beautiful! Well worth the 50 mile (plus) round trip from St. George. We arrived on a Sunday so there was no one in the office. We had made a reservation so the site information was ready for us. However, we found it extremely confusing to identity the site. They are not clearly marked and we originally pulled into the wrong space and then, even after we found it, parked our car on the wrong side of the coach. It was very hot. I took our dogs to a city park for walks as there are goat heads in the park along the roadside. There is not a good place for dogs to walk. And it was very hot. 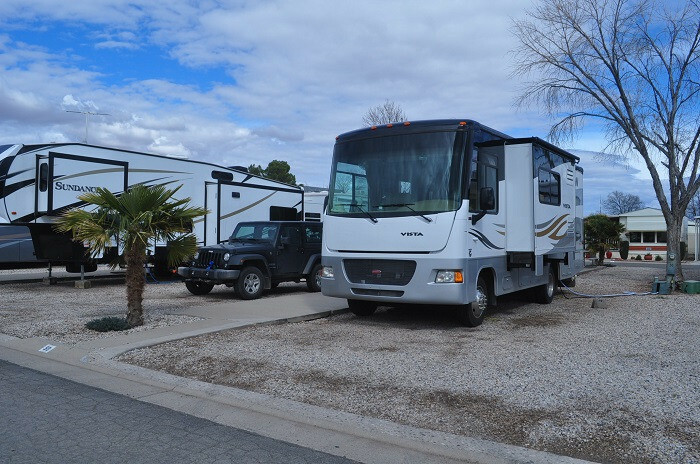 We camped at McArthur's Temple View RV Resort in a Motorhome. Cable had to have special box for each TV. Wi-fi needed a special box for good reception. Other than the manager, staff was not real knowledgeable about the how the systems worked. Sites were small, but adequate. Concrete patio and small picnic table. Sewer connection required a doughnut ring. Wrong size for either a 3" or 4" threaded connection. Did not feel like a RV park, more like a large parking lot. Lots of park models for the snow birders. They did have a swimming pool and hot tub. 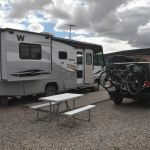 We camped at McArthur's Temple View RV Resort in a Motorhome. St. George is a major city with all the major stores available. National parks near by. We stayed here for 6 days to visit the area including Zion NP. Spa & pool are nice. Utilities all worked. Staff helpful. Weather hot. 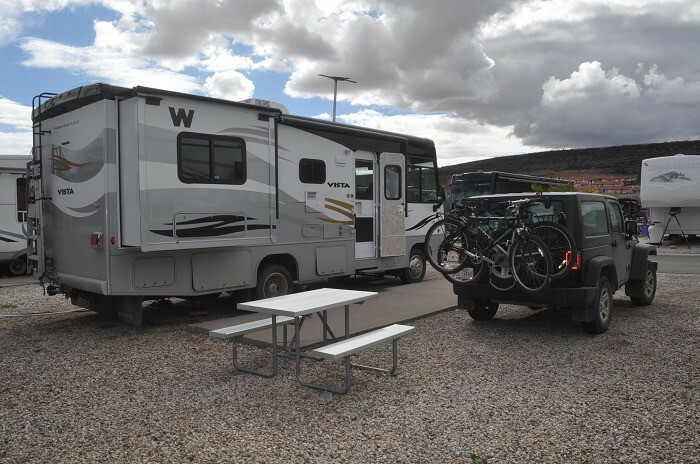 We camped at McArthur's Temple View RV Resort in a Motorhome. The first day we went to Snow Canyon state park, just west of town and walked some of the trails and features. We found a shaded picnic table for lunch and were visited by squirrels, a blue jay, and chipmunks. Feeding animals is discouraged. The next day we left for Zion NP at 8AM and after parking near town bus stop #2 ($21) walked to the visitor center and stood in line for 45 minutes to board the park shuttle. Site was level and spacious, hookups all worked great, Verizon and cable TV were both good and the staff were super friendly and very helpful. Gravel lot but not an issue as campsite is very flat. Only real problem was the heat. Over 100 Deg F every day and the A/C had trouble keeping up! We'd stay again but not in June. 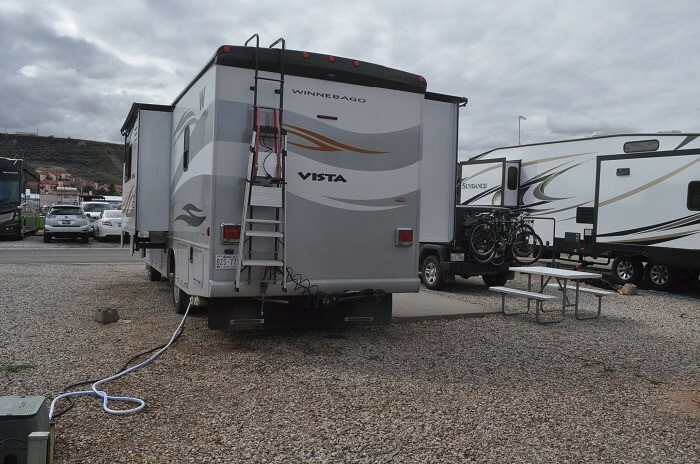 We camped at McArthur's Temple View RV Resort in a Fifth Wheel. One hour drive from Zion. We have stayed here several times as it is the only one in the area located where we want to be. The park is old with narrow streets and sites, but they make it work. Wifi is useless. Staff is helpful and friendly. Utilities are good. Location is great. Almost all sites are back in. 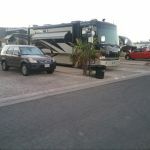 We camped at McArthur's Temple View RV Resort in a Motorhome. We stayed here for 5 nights. Visiting friends that moved here and going siteseeing. Very close to downtown. We had lots of room between sites when we first arrived. Here on weekend of iron man event. Even when park got full it was very quiet. As mentioned cable TV requires special box and access to rear of tv. However we received all major stations with antenna OTA in HD. AT&T cell service excellent. Great satellite as park has few trees in the way. Pool and spa very clean. Great areas to walk pets. Super friendly staff. Yes there are a lot of park models in the park as this is a snowbird area like a lot of southwest parks. Fairly empty of snowbirds in May. 50 amp power water and sewer all worked well and had area right next to motorhome for parking tow vehicle. Yes you are close and manuvuring a 40 ft. motorhome through park and getting into site requires caution. We would definitely stay here agan if in the area. 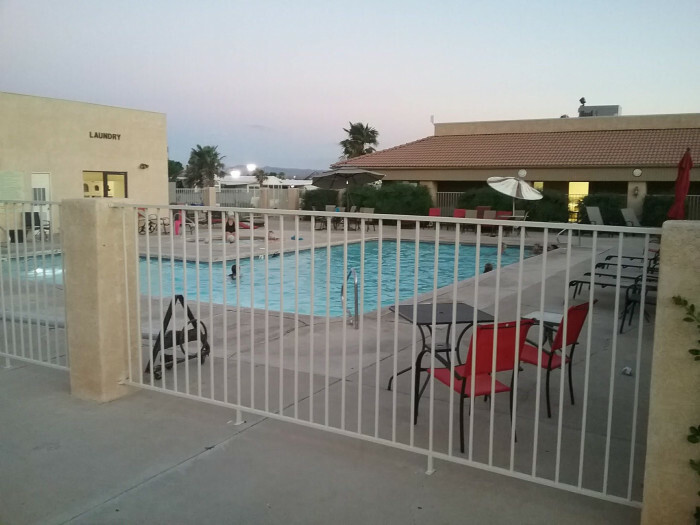 We camped at McArthur's Temple View RV Resort in a Motorhome. So many shopping areas and places to dine close by. Made reservation on Friday for Sunday. Their office is closed Sunday, but had packet available. Office failed to mention that cable was only thru a set top box, available at check in. Does not work for our tv set up. So no cable. WIFI had strong router signal but apparently modem was done. So no WIFI. Showers are at the office building a good block away from our assigned site. So an okay overnight but cannot rate it higher than a 2 for services. 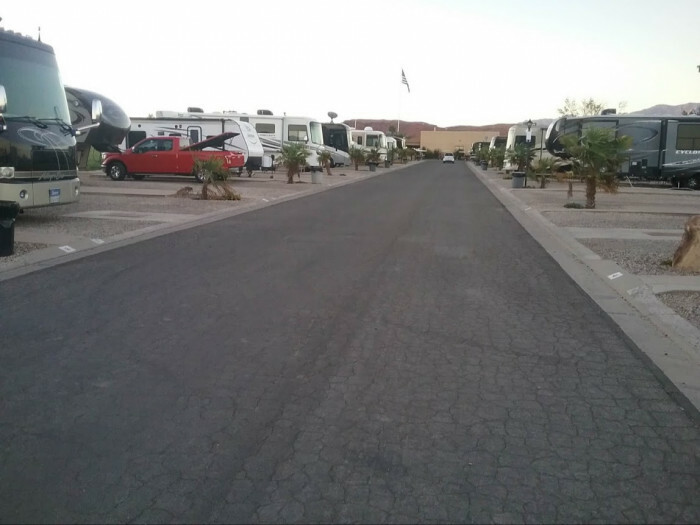 We camped at McArthur's Temple View RV Resort in a Motorhome. Big park in the middle of town. Close to shopping or any other services. Site was level and power and all utilities worked well. Verizon was excellent. Sites were very close together. Park was quiet even though it was close to major roads. There were very nice walking/biking paths close by. Managers were very nice and helpful. 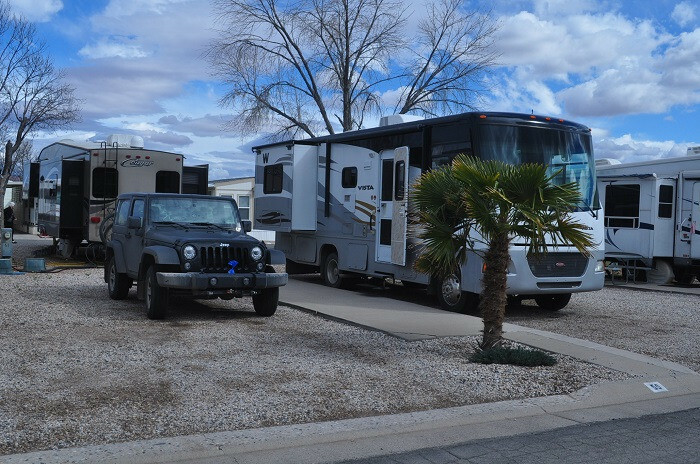 We camped at McArthur's Temple View RV Resort in a Fifth Wheel. We were placed in a temporary spot which means in their storage yard!! Falling apart trailers, an electric extension cord over the fence and a water hose, no sewer. No WiFi - can't even connect in the office. Total rip off for $35 a night. We are not in the park at all. If you are going to be somewhere with half the services the price should be half. We camped at McArthur's Temple View RV Resort in a Motorhome. 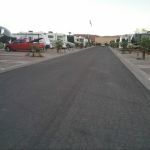 More of a mobile home park with an RV park on the side but nice large spots on gravel. Full hookups and picnic table on site. 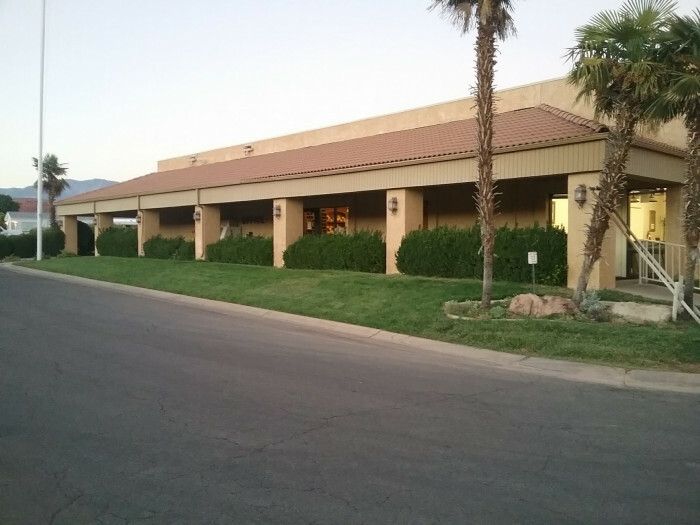 Excellent location in St George. Roads are a little tight for larger rigs with a trailer being pulled but definitely doable. 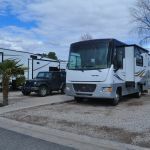 We camped at McArthur's Temple View RV Resort in a Motorhome. Stayed at Temple View a number of times over the years. This stay was another good one. Easy drivable roads, close to retail. Beautiful scenery. Close to Zion's National Park. 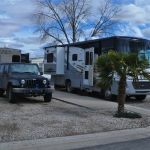 We camped at McArthur's Temple View RV Resort in a Motorhome. Grocery stores, restaurants, movie theaters all very close. Easily drivable to Tuachan outdoor amphitheater with it's quality Broadway presentations. Snow Canyon with it's spectacular canyons within miles. Checkout Traders Discount store across the street. Close to Zion National Park, but recommend that you arrive as early as possible as parking lots fill quickly and parking in Springdale is expensive. We arrived at 7AM and the visitor center lot was already one-third filled. Lovely town with lots of shopping and amenities you could want. Zion National Park is a short drive from St. George. Visit towns of Hurricane and Springdale. Definitely recommend going to Tuachan Amphitheatre for a play. We have been twice and it is excellent! The amenities for the long-term residents look quite nice. 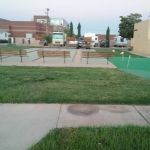 I would not tolerate the space we had for more than an overnight, and even so with many vacant proper RV spaces they didn't need to put us in the "parking lot". 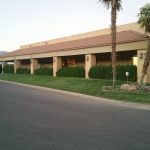 Within walking distance to a great restaurant Black Bear Diner and additional shopping. Also near Camping World. Very easy on and off of interstate 15. St George is near to Snow Canyon SP and Zion NP, both great parks. For those of you who are mormons, there is some history in the city. Smiths Market about a mile up Bluff Ave is good. George's resturant on St. George Ave is very good. Sakura Japanese Restuarant is excellent. Weird alcholo laws in UT: you have to order food to get a drink at a bar. NOTE: buy your wine, beer and spirits in AZ, CA or NV. The selection is limited and the prices are high at the UT state liquor stores. The beer sold in markets is 3.2! Town of Santa Clara is at one end of St. George. We found this quaint little town in the historic area, to be the best "find" of our vacation. Go on a movie date right next door. There are endless cycling - both on and off road - opportunities in this area! We loved the downtown for unique eats and historic walks in the park. 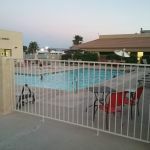 Are you affiliated with McArthur's Temple View RV Resort ?